A no-frills tee shirt in our classic silhouettewith a very friendly price point. 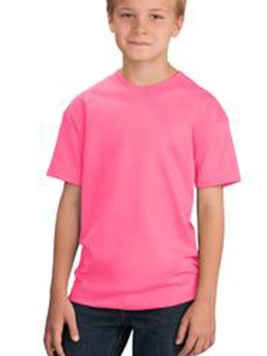 5.4-ounce 100% preshrunk cotton, tag-free label, cover-seamed neck, shoulder-to-shoulder taping, and double-needle hem. Ash is 99/1 cotton/poly. Athletic Heather is 90/10 cotton/poly. Neon Green Neon Pink Neon Yellow Heather Athletic Maroon Heather Purple Heather Royal Heather Navy Heather Dark Chocolate Brown and Dark Heather Grey are 50/50 cotton/poly.